"French Kiss" is a 6 bedroom beachfront home that sleeps 22 guests. It features a private heated* pool and is just steps from the world famous Panama City Beach. Enjoy family fun on the beach and have a bbq on the deck while looking out at the beautiful Gulf of Mexico. This is a perfect family getaway! 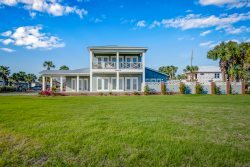 This home is located in the heart of Panama City Beach Florida, known for having the world's most beautiful beaches. This great family home is close to shopping, dinning, and the best kids attractions such as Ripley's and Wonder Works. "French Kiss" sits right next to our other vacation home, "Burnt Bottom"
Check out the virtual tour that takes through every room of "French Kiss." As you step into "French Kiss" you will notice a cozy entryway featuring a Queen Sleeper Sofa, a flat screen TV, and unique decor. Down the hall on the first floor is a kitchenette with a mini fridge, an additional full sized fridge, a half bathroom, and a door leading to the outside deck and outdoor shower area. Take the stairs up to the second floor of the luxury vacation home and you'll notice a great open floor plan. There is a fully stocked kitchen, equipped with all you will need during your vacation, bar seating for 5, a round dining table that seats 10, and a living area for relaxing. The living area is complete with a flat screen TV, electronic fireplace, and wonderful views of Panama City Beach. Step outside to the second floor deck and relax by the pool or have a bite at the outdoor dining table. Walk back in and down the hall is a half bathroom and two bedrooms. There is a Queen over King bunk bedroom with en-suite and a flat screen TV. Across the hall is a King bedroom with en-suite and flat screen TV as well. On the third floor there is a common sitting area with flat screen TV and Queen Sleeper Sofa. There is also a twin over twin bunk nook and a full washer and dryer. Down the hallway is one Queen over King bunk bedroom with en-suite and a flat screen TV. Across the hall is a Queen bedroom with en-suite and flat screen TV as well. The south end of the home features to master bedrooms with wonderful ocean views. Each King master bedroom features a walk-in shower in the connected bathroom and direct access to the furnished balcony, overlooking the Gulf of Mexico. Our stay was fantastic! Relaxing and a true vacation. The home was beautiful and comfortable for our guests, so much so that we never left except to go to the beach!